Water - The next idea was to just flush them out with water. We put the hose up to the holes and opened the valve. Wet ground squirrels kept popping up all around us. When we were done, the water absorbed into the soil. That left us with freshly bathed ground squirrels with clean burrows. Dog Hair - Dog hair sounded like a terrific idea. It didn't cost us anything and we had a never ending supply. (Our ranch dogs are Great Pyrenees - big, white and fluffy dogs that shed.) The thought was that you put dog hair in the ground squirrels' burrows and the little critters would smell the dog and run away in fear. That's not quite what happened. The ground squirrels were running alright, actually more like frolicking in our fields with giant white dust bunnies floating through the air. At least the birds helped gather up all the dog hair and used it in their nests. Spray Insulation - After a stop at Home Depot, we were armed and ready to stop the ground squirrels once and for all. With cans of orange spray insulation in hand, we began to fill the holes around the foundation of the barn. Apparently, the little pests thought that we were feeding them spray cheese. They chewed right through the stuff and spread it throughout the ranch. I have to admit it added a little color to the place. Although, visitors often asked in a concerned voice, what the pieces of orange lava looking stuff was. Urine - We heard and read a few places that we should put coyote urine or human urine in the holes. This is one we never tried. I couldn't find a coyote willing to pee in a cup and as far as finding a person...we had too many holes and not enough beer. 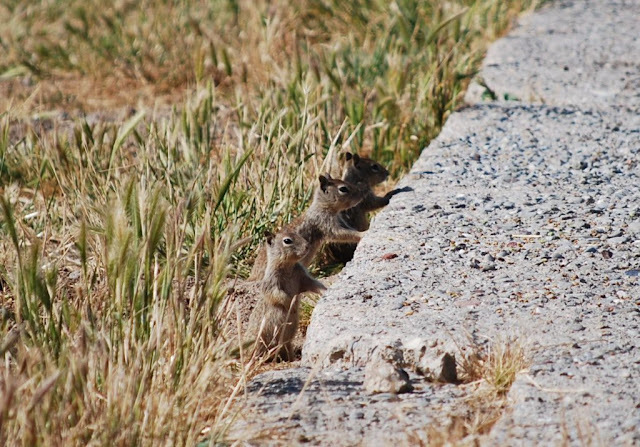 Dealing with ground squirrel over-populations can be extremely frustrating, so finding the humor in it all, helps. What also helps is discovering a green solution that actually works! Now with the Burrow Blocker, we don't have a problem with ground squirrels, but we can no longer blame the destructive critters when we act a little nutty. Do they just get discouraged and move away? In my case i use Victor M792 it is a rodent repeller. We buy it one week ago and it work's very good.